Dr. Thomas E. O'Connor has more than 25 years of experience performing dental implant procedures and can help you enjoy the benefits of this solution for tooth loss. As a dentist committed to advanced restorative procedures, Dr. O’Connor feels privileged to treat patients who have previously struggled with failing dental work, ill-fitting dentures, a lifetime of dental problems, or comprehensive tooth loss. 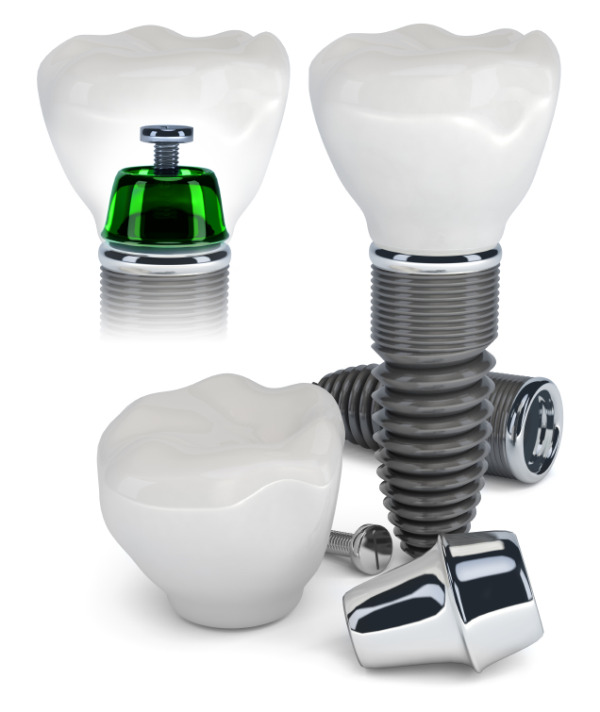 Dental implants are artificial teeth that are permanently placed to function and look just like natural teeth. With dental implants in St. Louis, Dr. O’Connor can provide patients with an ideal alternative to dentures or traditional dental bridges. Implants help maintain healthy jaw bone density while enhancing appearance and bite functionality. During dental implant placement, a titanium screw is surgically inserted into bone and a natural-looking restoration is then attached. In the weeks and months following the procedure, jawbone grows around the screw, a process called osseointegration, anchoring it in place permanently. Teeth can be replaced individually with single implant posts, or comprehensively, with a number of posts supporting a larger restoration, making dental implants a possible treatment for single tooth loss or widespread missing teeth. If you have missing teeth or teeth that are decayed and in need of replacement, dental implants could be the right fit for you. Schedule a consultation with our St. Louis implant dentist, Dr. Thomas O'Connor, to find out how implants can fill in the gaps in your smile, restoring both aesthetics and function. When compared to dentures and other restorations, dental implants offer many advantages for patients seeking durable teeth replacements, including: the preservation of jaw bone health, ease of maintenance and oral care, and protecting existing tooth structures and gum tissue. With dental implants, patients often experience a dramatic positive change in their lives, especially with new technology available through digital implant treatment. If you or someone you know is dealing with problematic dentures or weak and damaged teeth, Dr. O’Connor can help. With significant experience in all phases of restorative and implant adult dentistry and after placing dental implants for over 25 years, Dr. O’Connor helps patients discover a great solution to dental problems. Please read some of the 200+ positive reviews from our family of satisfied customers or call our St. Louis implant dentist today for your implant consultation.